ate sharing policies that model MOUs they currently have in place to share information. For example, the sharing of blue force positions to specifc partners only during multi-agency events can be easily confgured to automatically shut off at the completion of the event. Additionally, by building mobile frst user interfaces, feld personnel using mobile devices have the same software as operators using PCs in the command center. ARES Security recently participated in a ‘DHS Next Genera- tion First Responder Exercise’ to Evaluate New Technologies. 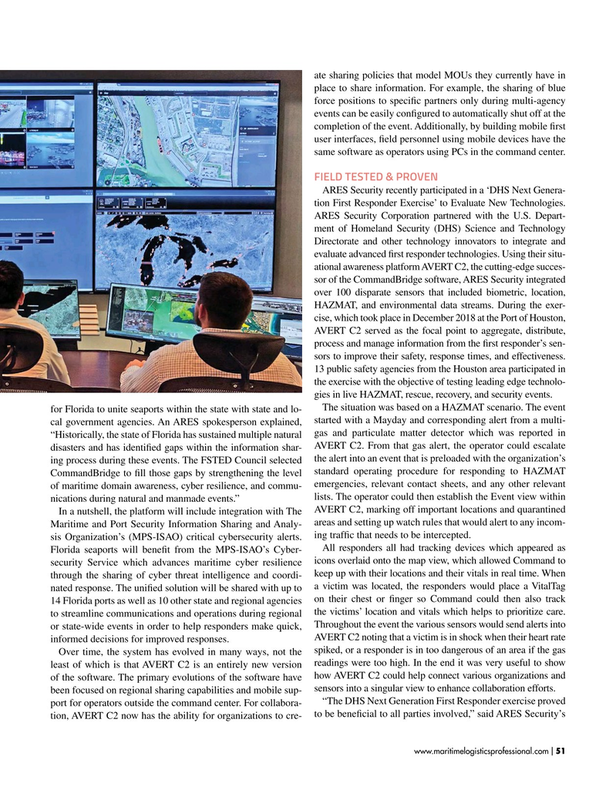 AVERT C2 served as the focal point to aggregate, distribute, process and manage information from the frst responder’s sen- sors to improve their safety, response times, and effectiveness. 13 public safety agencies from the Houston area participated in the exercise with the objective of testing leading edge technolo- gies in live HAZMAT, rescue, recovery, and security events. Maritime and Port Security Information Sharing and Analy- sis Organization’s (MPS-ISAO) critical cybersecurity alerts. ing traffc that needs to be intercepted. AVERT C2 noting that a victim is in shock when their heart rate informed decisions for improved responses.